Image by Brataffe - Atlantic Highway, Norway, licensed for reproduction, under Wikimedia Commons License. Day 1 After flying into Alesund transfers will be provided to get to Molde, time for bikes to be assembled and prep for the following day. Day 2 is the one of the feature days as we head up to the Grand Atlantic Ocean Road. An incredible section of road that skips from Island to Island with breathtaking views of the surrounding fjord. A testing but flat day of 130kms. 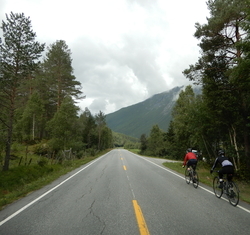 Day 3 is the easiest of the days with a scenic ride round the Fannefjord, and a picturesque routes towards the town of Andalsnes. 92kms. 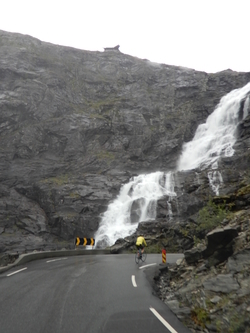 Day 4 is the last and most testing day with the ride up the incredible Trollstigen, a fantastic piece of road that winds up the valley coming tantalisingly close to the waterfall with 12 hairpins! Its then a long ride back to Alesund with views over the Storfjorden. We shall arrive on day 1 - we shall either meet at the airport or our confirmed joining hotel. We set off riding on day 2, riding for 3 days. Day 1 - Arrival into Alesund -transfers to Molde will be organised for a specific time, details to be confirmed. All participants are required to have personal contents insurance. Adventure Cafe cannot be held responsible for any lost luggage or damaged property. Please try to use either a carboard box or bike bag for transportation, there may be limited space availble.